The South Korean President’s shuttle diplomacy may fracture his relationship with the US. North Korean Chairman Kim Jong-un scored a huge diplomatic victory on Tuesday when he finally got the chance to hold a summit with US President Donald Trump, a feat his grandfather and father never achieved. In addition to the credit Kim and Trump received for their courageous acts, South Korean President Moon Jae-in should also be recognised for his tireless efforts to make this summit a reality. From hosting the third and fourth inter-Korean summits within a month of one another, to persuading Trump at the White House to meet Kim, Moon has done the best he can to further his agenda for an independent foreign policy. However, the outcome of the summit may not live up to Moon’s expectations. Trump and Kim’s joint statement does not go beyond the language of the Panmunjom Declaration, failing to bridge differences between the US and North Korea over “denuclearisation of the Korean Peninsula”, and not even mentioning Trump’s often-taunted CVID (complete, verifiable, irreversible disarmament) model for North Korea, either in whole or in part. Moreover, Trump granted a huge concession to Kim when he promised to halt “expensive” and “provocative” joint military exercises with South Korea, on the grounds that the momentum for peace should be maintained when talks with Pyongyang are going well. Moon may applaud the summit as the beginning of a long process towards peace and denuclearisation; still, the reality that such an accomplishment is likely to come at the cost of the US–South Korea alliance, without any clear roadmaps on denuclearisation, may not bode well for South Korea in the long run. Moon’s independent foreign policy is founded on two main pillars. On the one hand, he embraces rapprochement with Pyongyang to encourage the North to open the country and peacefully give up its nuclear weapons. Moon’s thinking paved the way for North Korea’s participation in the Winter Olympics and the two inter-Korean summits, despite the fact that North Korea has not made any irreversible and verifiable concessions to the South. 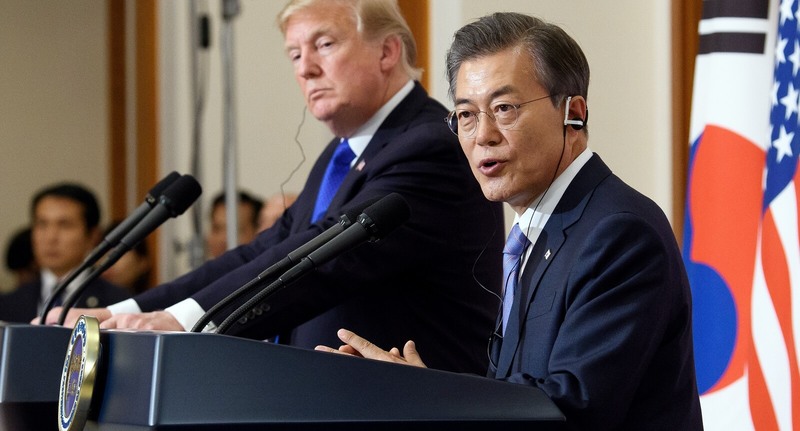 On the other hand, Moon strengthens the alliance with the US by coordinating the two allies’ outreach to the North and affirming the long-term US presence in the South, irrespective of any peace treaty signed with Pyongyang. This strategic hedge between Washington and Pyongyang helps Moon stay in the driver’s seat of Korean diplomacy and preserve the South Korean–US deterrence posture to cope with both high and low levels of North Korean threat. So far, Moon’s strategy has been a success. His shuttle diplomacy has brought the US and North Korea back from the brink of war, and serves as a force of restraint against unilateralism from Washington and Pyongyang. Having witnessed the collapse of former president Roh Moo-hyun’s “Sunshine Policy”, Moon understands that peace with North Korea can only be achieved after a long and committed process by both sides, with North Korea dismantling its nuclear arsenal in tandem with the US scaling back its presence in Korea under Seoul’s watch. Unfortunately, Moon’s plan clashes with Trump’s transactional and zero-sum vision of an alliance, which calls for the withdrawal of US troops from the South not on the basis of an improved security environment but on unfair burden-sharing between the two allies. Trump has not abandoned that view, and his statements at the summit once again increase the risk of a fracture in the US–South Korea alliance. The lack of proper coordination with the US will also make Moon’s outreach to Kim shallow and significantly one-sided in Kim’s favour, as Moon has few concessions to make, apart from reviving joint economic projects and boosting inter-Korean civil and governmental exchanges, to keep Kim invested in the denuclearisation process. The unbalanced relationship between Pyongyang and Washington under Roh Moo-hyun, when Seoul was not able to secure Washington’s coordination and Pyongyang’s clarity on its nuclear arsenal when establishing a phased roadmap for North Korean denuclearisation, should serve as a prime example of how Korean rapprochement can fail. Moon deserves credit for the Trump–Kim summit and has the right to be hopeful about the new relationship between Pyongyang and Washington. Nevertheless, the ambiguity embedded in the joint statement indicates that, until he can help foster a clear agenda for North Korea and the US to fulfil their promises in a verifiable manner, his job is not done yet. Striking a balance between Pyongyang and Washington will never be an easy task. Moon needs to affirm his central role in the rapprochement process in order to find a common denominator for the US and North Korea.